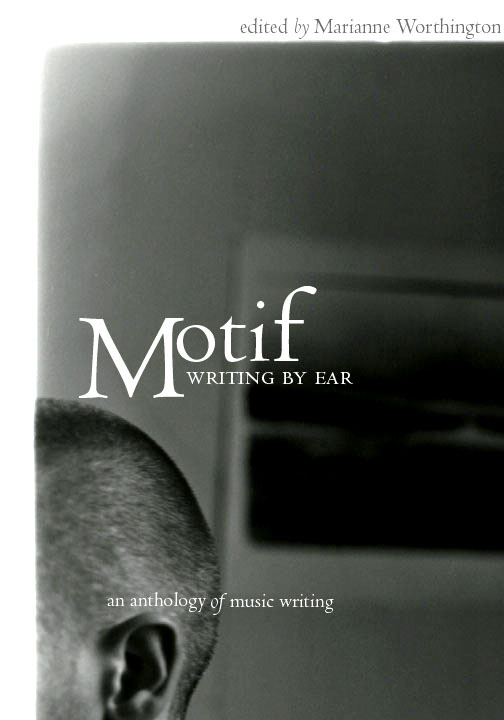 MOTIF: WRITING BY EAR, An Anthology of Writings about Music, is Volume 1 in the MOTIF anthology series from publisher MotesBooks. Future editions will focus on other themes, but each submission in this first collection uses music as a motif, either prominently or in artfully subtle ways. This first MOTIF anthology includes fiction, nonfiction and poetry, as well as some song lyrics by the likes of Patty Griffin and Buddy & Julie Miller. Other contributors include Silas House, Barbara Crooker, Pamela Duncan, George Ella Lyon and Maurice Manning. MOTIF is available at amazon.com or through the publisher: order@motesbooks.com. This entry was posted in Uncategorized on March 16, 2009 by Marianne Worthington.